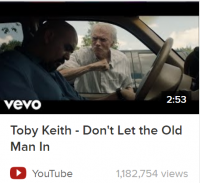 Toby Keith was with Clint Eastwood not long ago, and asked him how he stayed young at 88 years. Clint just produced, directed and was the star of a new movie called “The Mule.” Clint said he doesn’t let the old man in. So, Toby went home and wrote a song about it…Watch today’s show to hear the song. What is a man? And does the soul of man grow old? Not if you don’t let it, according to Clint Eastwood and Psalm 92:12-14. The Church has failed men, today. Look at what has happened to men in our culture. They’ve been feminized. And we see it in all the different “genders” and “sexualities” being defined and re-defined. Science is supposed to be truth. We live in a culture of voodoo science. People are just making up their own science. Whatever happened to real science? Look at all the different sexualities we have these days. Pan sexuality, asexuality, homosexuality, bisexuality, gray sexuality(?!). Who came up with these terms and definitions? And why are we taking this stuff seriously? !